Rainbow Six Siege, is coming and it looks great! They are also looking to improve the game’s first-person shooter experience. Rainbow Six Siege is an exciting, new approach to the first-person shooter experience that puts tactical combat and masterful destruction at the center of the action. Lead your team of unique, counter-terrorist Rainbow operators through tense and thrilling combat scenarios, and achieve victory through smart preparation and strategic improvisation. The Siege is a brand-new style of gameplay embracing the reality of counter-terrorist operatives across the world: intense and asymmetrical close-quarters combat between attackers and defenders. In this trailer, a team of gamers select CTU Operators and coordinate their plan of attack in a 5v5, PVP multiplayer battle to secure the objective. Defenders have the means to transform their environments into strongholds; they can trap, fortify, and create defensive systems to prevent breach by the attackers. To face this challenge, attackers now have a level of freedom unrivaled by any previous Rainbow Six game. Combining tactical maps, observation drones, and a new rappel system, they have more options than ever before to plan, attack, and defuse these situations. 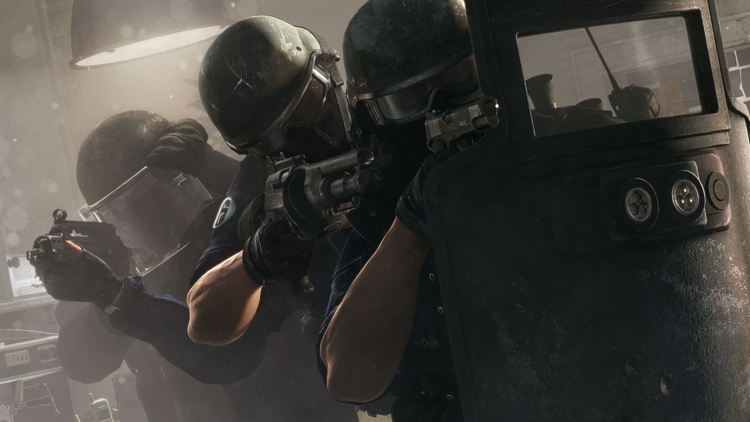 Rainbow Six Siege will be available on Xbox One, PlayStation® 4, and PC this fall 2015. Angela Bassett: A new threat has been confirmed in our world: the White Masks. They are highly lethal and indiscriminate of age, religion, or nationality. To stop this organization, Agent Six is delivering a clear mission: to recruit the best operators from around the world. Team Rainbow must stand ready. Terrorist Hunt Co-Op Trailer: Playable solo or cooperatively with up to four additional teammates, TerroHunt places the player in hostile situations where gripping challenges, addictive replay value, and advanced enemy AI proficient in the elements of the Siege abound at every turn. The long-awaited return of Terrorist Hunt (TerroHunt) brings a new threat into the world of Rainbow Six: the White Masks.